Restaurant Menu Wordpress is a jQuery 3D Menu list for your wordpress restaurant website. 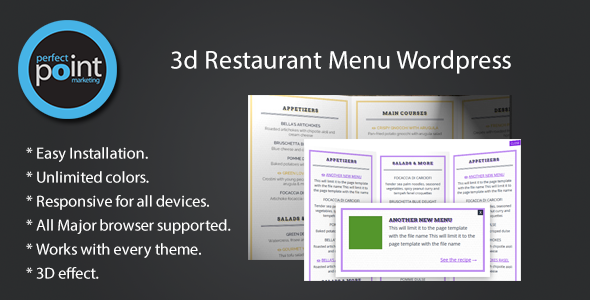 This plugin will enable awesome 3D Restaurant Menu. You can change theme color, you can create menu, assign them in page, logo uploading & other settings & by using the options of this plugin. The plugin has clean & easy documentation for how to setup the menu for your site.